When I first started blogging, my first blog, Scots Law Blog, was created using WordPress.com. The resulting domain name was not a standalone one, but instead was in the form of x.wordpress.com (known technically as a ‘subdomain’ of wordpress.com). This was okay for me starting off and it did have its advantages, as noted below. But it wasn’t quite what I wanted. Below are some of my recommendations for choosing a good domain name for your law blog, together with a note of reasons for and providers of hosting for WordPress blogs. You are able to upload many more themes and plugins to your own self-hosted blog than would otherwise be available through wordpress.com. You have much greater flexibility over positioning and choice of advertisements which can help fund your blog. You won’t have to display wordpress.com ads (wordpress.com currently charge around £20 to make sure there are no third party ads on your blog). You will have most things you need to get started with your blogging quickly. Your blog automatically becomes part of the wordpress.com blogosphere. So, for instance, WordPress.com has stated that, on 12 April 2012, there were 398,738 bloggers posting 948,602 new posts, with 1,502,650 comments, with a total of 197,919,694 words posted all in the one day on WordPress.com. Further, the best posts get featured, so you don’t necessarily have to have a big network to get found if you’ve written some great content worth sharing. 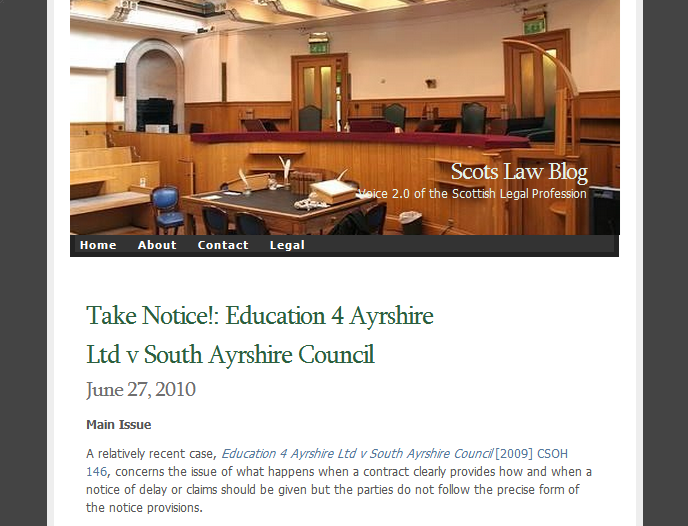 Indeed, some of the finest law blogs in the UK remain wordpress.com subdomains such as charonqc.wordpress.com, legaleaglemhm.wordpress.com or highlandlawyer.wordpress.com. It should be noted that you can opt to have a wordpress.com blog under your own domain name (although the fee for this is around £10 per month). There are many companies through which you can register a domain name for your law blog. Having experimented with several, I would highly recommend Dreamhost (affiliate link). The main reason is that once you’ve registered your domain name with them, their integrated hosting offering then helps provide a seamless service. To choose the best domain name for your law blog, you should then experiment in the domain search section, searching for potential names. It’s a matter of choice between a keyword-rich domain name eg familyandpersonalinjurylawblog.com (I haven’t checked but that’s probably not yet registered), or a domain with your firm’s name or your own name, or alternatively a domain name that has some other meaning but which doesn’t necessarily have any keywords or relate to your name or your business’ name. I would highly recommend choosing a keyword-rich domain name (although you’d expect an SEO professional to suggest that). BUT with so many legal blogs now on the web don’t be surprised if your preferred url is already taken. You’ll probably have to do some degree of searching before you find your perfect one, or alternatively you may have to start looking to buy domain names already registered by others for a steeper price. In terms of domain name pricing you should, at least through Dreamhost (affiliate link), or other reputable companies, be able to register a .com domain name not already taken for $10 per year. I once got ripped off for a .co.uk domain for around £80 per year. Make sure you do not get ripped off. As an aside I’ve been hearing horror stories of law firms buying domain names for hundreds of thousands of pounds. If you’re about to splash out on a domain name or even website that has been optimised for search, take expert advice first of all. For WordPress hosting for your law blog, I’d highly recommend using Dreamhost (affiliate link). It’s ideal for new webmasters, given its automatic software installers – i.e. without any technical knowledge you can have WordPress installed on your first site up and running within around 5 minutes. That’s exactly how my WardBlawg sites were created and still operate. Another advantage is that you can have unlimited domain names on your account. Domain names can be bought via Dreamhost very easily for $10 per year (I use a UK bank account to pay this). Your domain name value can, of course, rise in time, and the transfer process is similarly very easy to manage. You also get unlimited diskspace and bandwidth included under their monthly fee ($8.95 per month – again which can be paid through a UK bank account or via PayPal). The customer service you receive, in my experience, is also second to none. When I started a couple of years ago I was very new to all this stuff. The Dreamhost team were able to respond quickly and accurately to many of my queries. There are other hosting providers such as Hostgator or VPS, but in my experience Dreamhost is the one to go for. In a future post, I’ll explain more about my experience of different themes and other important aspects of blogging. If you’d like me to talk you through the steps required in setting up your own law blog, please do not hesitate to contact me here or leave any comments or questions you may have in the comments section below or on Twitter, Facebook, Google+ or LinkedIn. PPS check out this beginner’s guide to successful blogging from First Site Guide who also kindly listed us as one of the best law blogs to follow in 2015. You may also want to check out this guide to WordPress blogging from WPExplorer . Thanks for sharing this information. I am in the process of starting my blog and am planning on using WordPress. But may now look into the self hosted route. Great tips, perfect timing as I was considering starting a law blog, and this just provided the inspiration to do it!